The ideal of inclusive, cross-class interaction in mixed-income communities is often undermined by the enforcement of social order, including management actions that restrict social gatherings in public spaces and rules relating to housekeeping and noise levels. Residents of mixed-income neighborhoods share a desire for high-quality neighborhood institutions and amenities, but they do not always agree on what “high quality” means. Attentive design of affordable housing can reduce class-based stigma and promote resident engagement. 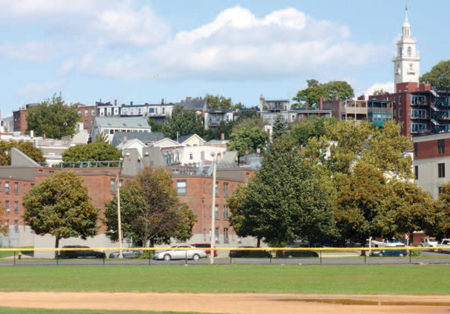 Mixed-income developments integrated among other housing and a park in South Boston. Mixed-income neighborhoods have become objects of policy and research attention, and a number of research initiatives have used survey and administrative data to assess the effects of mixed-income policies on resident and neighborhood wellbeing. Ethnographic methods, a form of qualitative research defined by indepth observations of social settings, offer an important complement to this quantitative research. An emerging body of ethnographic research on mixed-income neighborhoods uncovers how residents make sense of their economically diverse surroundings and how they interact with neighbors and institutions in ways that influence personal and community well-being. Ethnography is a form of qualitative research defined by in-depth observations of people in their natural surroundings over an extended period of time. The primary form of ethnographic data collection is participant observation, in which researchers observe people interacting in particular social settings and keep written, oral, and visual records of their observations. Although participant observation is ethnography’s defining feature, ethnographers often supplement their observations with other forms of qualitative data collection. These forms include in-depth interviews, in which researchers ask open-ended questions designed to uncover the motivations and meanings behind the behaviors they observe, and content analysis, in which researchers analyze the substance and meaning of written or visual secondary materials such as newspapers, television shows, and advertisements. The objectives of these qualitative research methods are different from, but complementary to, the objectives of quantitative research. Most quantitative research is deductive, beginning with a specific predetermined hypothesis that dictates what data are collected and analyzed. Data are collected using a standardized method, with the same questions asked of a large, representative sample of a population. The data are then quantified to reveal the frequency of behaviors or attitudes. The quantitative approach is best for answering “how many” or “how common” research questions. Qualitative research, by contrast, is inductive. Rather than determining all hypotheses in advance, qualitative researchers allow for discovery during the research process — one does not always know what is meaningful or important before starting the research. Qualitative data analysis is an iterative process in which researchers analyze the data as they are collected and adapt their data collection methods as they discover the meaningful and important aspects of a particular social setting. Qualitative research is also interpretive, asking “how” and “why” rather than “how many.” For example, instead of asking how common a behavior is, qualitative researchers ask about the meaning of that behavior. In particular, ethnographers discern meaning by observing the interactions, reactions, and interpretations of behaviors as they unfold in social settings. Because this process requires intensive and extended observation, ethnographers typically focus on observation quality rather than quantity and aim for a rich, detailed understanding of a small number of social settings. A small but growing number of researchers have conducted ethnographic studies of mixed-income communities. Some studies have examined mixed-income housing developments, whereas others have examined larger mixed-income neighborhoods. Development-level ethnographies have focused primarily on mixed-income developments funded by HOPE VI to redevelop public housing, although the developments studied have different sizes, racial compositions, and income distributions. Neighborhood-level ethnographies have examined a broader array of mixed-income neighborhoods, Ethnographers discern meaning by observing the interactions, reactions, and interpretations of behaviors as they unfold in social settings. 13 including both gentrifying and stable mixed-income areas and areas created through a range of project-based and scattered-site subsidized housing; these neighborhoods also varied in theirdemographic and economic composition. These ethnographies focus on different places and ask different research questions, but taken together they reveal several common themes about the dynamics of mixed-income communities. 1) Residents of mixed-income neighborhoods organize around social identities other than income. By definition, mixed-income neighborhoods contain residents with a range of incomes. Residents cannot “see” the incomes of their neighbors; instead, they recognize that they live in a mixed-income area through more visible social categories that are correlated with income, such as housing type (homeowner, renter, or subsidized renter), length of residence, and race/ethnicity. Ethnographers have found that residents of mixed-income neighborhoods view their neighborhoods through these more visible social categories and organize around them. For example, Mary Pattillo conducted a nine-year ethnography of North Kenwood–Oakland (NKO), an African American neighborhood on Chicago’s South Side undergoing widespread African American gentrification; since the 1990s, new construction and rehabilitation have flourished and public housing has been redeveloped through the HOPE VI program. Pattillo purchased a home in NKO in 1998, and since then she has conducted more than 100 interviews with residents and community stakeholders, participated in public meetings and neighborhood gatherings, and collected secondary materials such as newspaper articles and flyers.1 Pattillo found that relationships among residents of different incomes in NKO were structured by tenure length and housing type. 2) The ideal of inclusive, cross-class interaction is often undermined by the enforcement of social order. Surveys of residents of mixed-income neighborhoods reveal that they value living in a diverse area, but ethnographers who observe residents in their daily lives have found that these stated values are sometimes overshadowed by the enforcement of social order. This is what Erin Graves found in her ethnography of Maverick Landing, a racially diverse HOPE VI development in Boston in which she lived for a year, attended meetings, conducted interviews, and observed informal interactions. The 230-unit rental development was constructed in 2005; about three-quarters of the units were subsidized and the rest were market rate. Graves found that management actions dissuaded resident interaction, including rules prohibiting social gatherings in public spaces that were deemed loitering, housekeeping checks applied to subsidized but not market-rate tenants, and rules requiring quietness and orderliness that restricted bike-riding or music in common spaces.4 Graves found that managers instituted these rules and policies to appease market-rate residents’ complaints and concerns, and subsidized residents felt constrained by these rules and policies. 3) Residents of mixed-income neighborhoods have a common desire for high-quality neighborhood institutions and amenities, but they do not always agree on what “high quality” means. 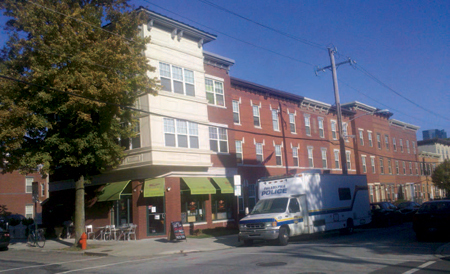 In Martin Luther King Plaza in Philadelphia, police mobile unit surveillance led to reduced use of outdoor spaces. Residents of mixed-income neighborhoods share a common desire for high-quality neighborhood institutions and amenities such as schools, businesses, and parks, offering the possibility of cross-class coalitions around these goals. But ethnographers have found that the ability to work together can be undermined by differences in what higher- and lower-income residents consider “high quality.” For example, Pattillo found that residents of the mixed-income neighborhood of NKO shared a desire to improve school quality, but class-based tensions emerged over the best solution.7 Lower-income residents wanted officials to restore existing neighborhood schools, whereas higher-income residents wanted options for selective enrollment schools; the higher-income residents ultimately prevailed. Neighborhood organizations and resident associations offer outlets for residents to network and take collective action, but ethnographers have found that residents of mixed-income communities have struggled to find the ideal composition and actions for these organizations. Some neighborhoods and developments have separate associations for homeowners and public housing residents whereas others have adopted communitywide membership, although the activities of the latter organizations are frequently dominated by either homeowners or public housing residents.10 Although collaborative cross-class and cross-tenure organizations can be difficult to maintain, they can be effective when founded and managed by trusted local neighborhood leaders who publically support equal representation. 4) Neighborhood identity is malleable and contested in mixed-income communities. Pamphlets, billboards, and websites that advertise mixed-income developments are often designed to appeal to market-rate residents, offering little mention of the subsidized units available or amenities that would appeal to subsidized renters. Ethnographers have found that promotional materials often highlight amenities such as gym facilities and granite countertops rather than units with many bedrooms, social service coordinators, or onsite childcare. The developments rarely mention the presence of subsidized units in their promotional materials, and examples abound of market-rate residents learning of the presence of subsidized units only after moving in.13 Developers say that these marketing strategies attract market-rate tenants to their buildings, and many subsidized tenants also appreciate the status and convenience that come with high-end amenities. However, ethnographic data also reveal that these methods project a subtle message about who “belongs” in the development — whose voice is heard and whose needs are valued — and these subtle forms of exclusion dampen the efficacy and engagement of subsidized residents. In rarer cases, these marketing strategies backfire when market-rate residents express anger and flee after discovering the subsidized units. These methods clearly serve the short-term goal of leasing units, but they may also undermine longer-term goals of effective neighboring and community cohesion. 5) The design of affordable housing can reduce class-based stigma and promote resident engagement. Ethnographers of mixed-income developments that replaced public housing find that former public housing residents report liberation from some forms of stigma when given subsidized units fully integrated into the surrounding community. Higher quality construction and physical upkeep yield a sense of pride, and, in sharp contrast with how they felt in public housing, former public housing residents report feeling inspired to invest in their community.15 In their ethnographies of three Chicago HOPE VI developments with units divided among public housing, affordable, and market-rate tenants — Oakwood Shores, Park Boulevard, and Westhaven Park — Mark Joseph and his colleagues found that the predominantly African-American former public housing residents in Chicago felt less external stigma after the physical transformation of their areas; outsiders were more willing to visit them, and some visitors were unaware that the development was subsidized housing.16 Subsidized residents still felt some stigma from the more racially diverse market-rate renters and homeowners in their developments, who routinely discussed the need to fix or alter their behaviors and values, but this new stigma was considerably weaker than what they had experienced in the old projects. Ethnography complements quantitative research on mixed-income neighborhoods in a number of ways. First, ethnography offers an opportunity for triangulation; identifying the same result with a different type of data strengthens confidence in that result. For example, surveys report high levels of resident satisfaction with physical amenities in mixed-income developments, and ethnographic work adds a new dimension to these findings by revealing how improvements in physical design reduce stigma and generate resident pride and investment. Second, the inductive nature of ethnography leads to new hypotheses that can be tested with representative surveys. For example, ethnographic research reveals how questions about cross-class dynamics could be asked in ways respondents understand, such as asking about neighbors of different tenure lengths, housing types, and races. Ethnographies also highlight the institutions and amenities around which cross-class bonding and conflict may occur, such as schools, policing, the use of common spaces, and retail investment; these subjects can be addressed directly in surveys. Finally, ethnography can elucidate mechanisms and explanations not observable in surveys. For example, surveys reveal little cross-class interaction. Ethnographies show how and why this phenomenon occurs; residents avoid neighbors of different incomes because their interests and preferences do not align. Cross-class interactions are dampened further through the actions of management, the stigma of public housing, and competing visions of community identity and quality institutions and amenities. Ethnographic research on mixed-income developments and neighborhoods reveal different, and sometimes conflicting, values among stakeholders over how community space should be used; it also reveals unequal power in the ability to realize these values. Still, the ethnographic insights described here suggest practices that could promote cohesion within mixed-income neighborhoods. Physical integration of subsidized and market-rate housing reduces stigma, the formation of community organizations by trusted local leaders around shared identities and goals may bridge class differences and promote neighborhood stability, and management practices could foster rather than dissuade resident interaction in common spaces. In time, such efforts may help bridge racial, cultural, and class differences and support stable mixed-income communities. Mary Pattillo. 2007. Black on the Block: The Politics of Race and Class in the City. Chicago: University of Chicago Press. Robert J. Chaskin and Mark L. Joseph. 2010. “Building “Community” in Mixed-Income Developments: Assumptions, Approaches, and Early Experiences,” Urban Affairs Review 45:3, 299–335; Robert J. Chaskin and Mark L. Joseph. 2011. “Relational Expectations and Emerging Reality: The Nature of Social Interaction in Mixed-Income Developments,” Journal of Urban Affairs 32:2, 209–37; Laura Tach. 2010. Beyond Concentrated Poverty: The Social and Temporal Dynamics of Mixed-Income Neighborhoods, Doctoral dissertation, Harvard University; Laura Tach. 2009. “More Than Bricks and Mortar: Neighborhood Frames, Social Processes, and the Mixed-Income Redevelopment of a Public Housing Project,” City & Community 8:3, 273–303. Naomi J. McCormick, Mark L. Joseph, and Robert J. Chaskin. 2012. “The New Stigma of Public Housing Residents: Challenges to Social Identity in Mixed-Income Developments,” City & Community 11:3, 285–308; Chaskin and Joseph, 2010; Chaskin and Joseph, 2011. Erin Graves. 2010. “The Structuring of Urban Life in a Mixed-Income Housing Community,” City & Community 9:1, 109–31. Laura Tach. 2011. “Imagined Communities, Contested Realities: How Stakeholders Understand and Negotiate Space in Mixed-Income Developments,” Paper presented at the Annual Meeting of the Urban Affairs Association, New Orleans, Louisiana, March, 16–9. Andrew Deener. 2012. Venice: A Contested Bohemia in Los Angeles. Chicago: University of Chicago Press; Lance Freeman. 2006. There Goes the ‘Hood’: Views of Gentrification From the Ground Up. Philadelphia: Temple University Press; Pattillo; Deirdre Pfeiffer. 2004. “Before the Barbecue: Community Building and the Arts in a Mixed-Income Chicago Neighborhood,” Perspectives on Civic Activism and City Life 3, 14–24; Sylvie Tissot. 2011. “Of Dogs and Men: The Making of Spatial Boundaries in a Gentrifying Neighborhood,” City & Community 10:3, 265–84. Michael Maly. 2005. Beyond Segregation: Multiracial and Multiethnic Neighborhoods in the United States. Philadelphia: Temple University Press. McCormick, Joseph, and Chaskin; Chaskin and Joseph, 2010; Chaskin and Joseph, 2011; Pattillo; Tach, 2011. McCormick, Joseph, and Chaskin, 2012; Graves, 2010; Pattillo.